International wildlife law can be used as a tool to enhance conservation if a selective, informed approach is chosen to enhance cooperation among international wildlife lawyers and conservation professionals. 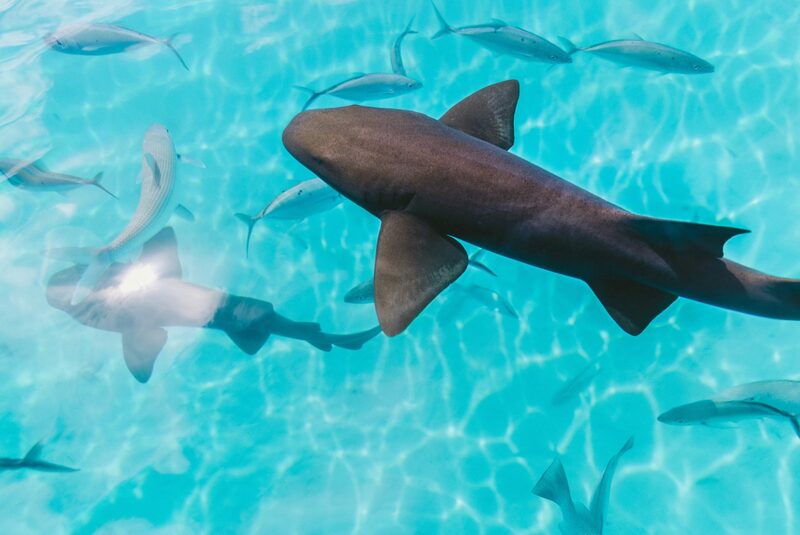 Nereus Program Fellow Richard Caddell (Utrecht) explores the limitations and opportunities of international wildlife law in a new paper he co-authored in BioScience. What is international wildlife law? Wildlife conservation agreements collectively comprise international wildlife law. This includes the ‘Big 5’ global instruments and a variety of regional instruments. These are binding agreements informed by non-binding instruments (i.e. Conference of the Parties, COPs) and action plans. The Convention on International Trade in Endangered Species (CITES) is an international agreement between governments that establishes protection for over 35,000 species of plants and animals in the scope of international wildlife trade. CITES currently has 183 members. The Convention on Migratory Species (CMS) is an international environmental treaty signed under the United Nations Environment Programme (UNEP) that acts as a global platform for the conservation and sustainable use of migratory animals and their habitats. CMS currently has 120+ party members. The Convention on Biological Diversity (CBD) aims to enhance the conservation of biological diversity and the sustainable use of the earth’s resources. CBD currently has 196 parties. The Convention on Wetlands of International Importance Especially as Waterfowl Habitat (Ramsar Convention) provides the framework for the conservation and wise use of wetlands and their resources. The Ramsar Convention currently has 169 contracting parties. The UNESCO Convention Concerning the Protection of the World Cultural and Natural Heritageaims to protect natural and cultural heritage by protecting World Heritage sites. The Convention currently has 193 parties. Effective action to sustain biodiversity is often hindered in international wildlife law treaties due to a lack of centralized legislative, executive, and judicial powers that characterize domestic law. Compliance is typically low in international wildlife law as a result of reluctance of governments and societies to impose long-term and enforceable constraints on economic development, often leading to a lack of action if expectations were set too high. Given that each international wildlife treaty has a considerable number of members, ideological differences between members can inherently limit the effectiveness of international wildlife law. Although international wildlife law has inherent limitations, it is the most effective mechanism for conservation because it aims to integrate cross-border approaches and long-term commitments. Previous successes of international wildlife law strategies include: protected areas, national legislation, priority for conservation on government agendas, as well as increased cooperation among stakeholders and funding for conservation. 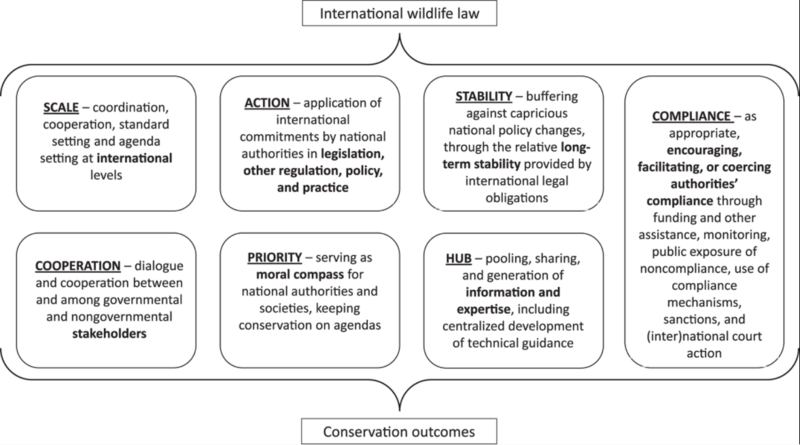 To maximize the potential of international wildlife law and to reap the full benefits of limited conservation funds, the consideration of individual circumstances will require unique strategy combinations. Facilitation should be prioritized instead of confrontation, because resistance can undermine long-term support for a legal framework. In some cases, litigation may be required in order to ensure compliance. International wildlife law can contribute to conservation in a number of ways. Image: “Figure 1” from Trouwborst, et al., 2017.